Every couple of weeks I spotlight a college I have visited in my blog. These posts are not meant to be an exhaustive discussion of the school; rather, I hope to share my impressions, point out some interesting facts about the college and perhaps prompt my readers to look at the school a little differently. 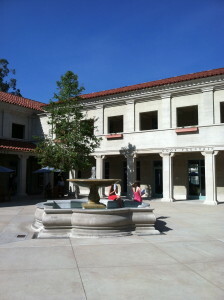 Over President’s weekend, my daughter and I headed south to visit the Claremont Colleges. We started with Pomona College, the oldest and largest of the five undergraduate colleges. With its stucco buildings, tree-lined streets and wide green lawns, Pomona is very warm and inviting. As we wandered the campus on a beautiful, sunny day in February with temperatures in the 70’s, we thought about all the students at the liberal arts colleges on the East Coast shivering from the effects of the polar vortex. No wonder Pomona receives so many applications! It has many great things to offer other than the weather, however. Here are a few tidbits that hopefully will encourage you to learn more about Pomona. 1. 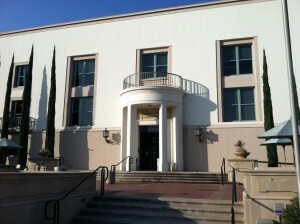 Pomona is a very residential college, and 99% of freshmen at Pomona live on campus. In order to help new students make connections when they arrive, Pomona creates sponsor groups – groups of 10-20 students who share a common interest. Each group has two sophomore sponsors, and there are usually two to three times as many applicants for the sponsor positions as there are positions. For more info about the sponsor groups, click here. 2. 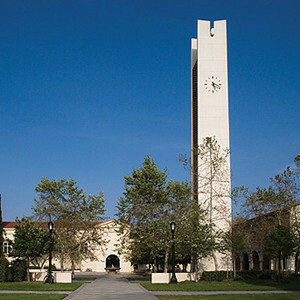 Pomona is a part of the Claremont Colleges, a college consortium that consists of five undergraduate colleges (Pomona, Claremont McKenna, Scripps, Harvey Mudd, and Pitzer) along with two graduate schools (Claremont Graduate University and the Keck Graduate Institute). With the exception of the Keck Graduate Institute, all six campuses abut each other in a one-mile square section of Claremont, California. This arrangement allows students at Pomona to register for classes in any of the other four colleges. It also makes Pomona feel larger – although it has approximately 1600 students, it is part of a larger community of almost 7,000 students, giving undergrads there the best of both worlds. You can find more information about the consortium by following this link. 3. Pomona is a highly respected, academically focused college with a broad range of classes and majors. 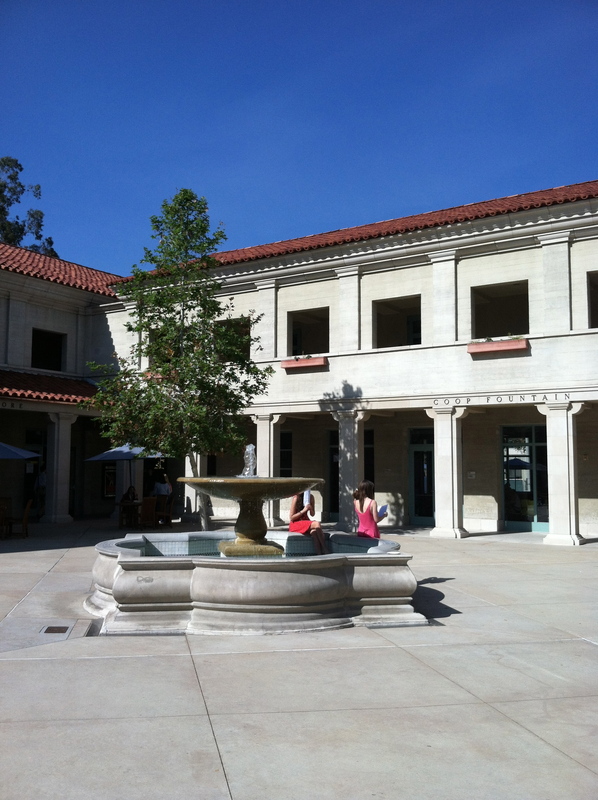 It shares its library (shown to the right) with the other four Claremont Colleges, and enjoys the third largest collection of books on the west coast, behind Stanford and USC. While its students can enjoy the benefits of cross registering at the other Claremont Colleges, no more that 30% of their classes can be taken outside of Pomona. Pomona has a “Breadth of Study” requirement, which means that every student must take at least one class in each of five broad subject areas. In addition, while AP classes will give an applicant the rigorous high school schedule Pomona is looking for, students wishing to enroll in higher level or accelerated classes as freshmen are required to take placement tests; high AP test scores are not enough. This link has more information about academic life at Pomona. 4. In order to be more competitive in athletics, the Claremont Colleges team up. Pomona is paired with Pitzer. Their team name is the Sagehens. Their original team name was the Huns, but the guides told the group that the name was changed around World War I, when being a Hun fell out of fashion. The guides said no one really knows why they picked Hens as the new name, but there is speculation that it was to save money, with only one letter to change on team uniforms. There is some confusion about the change, however, and a more complete history of Cecil the Sagehen can be found here. 5. 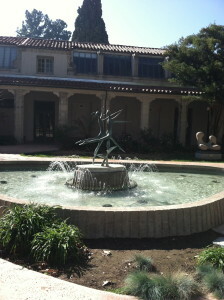 Fountaining is a popular tradition at Pomona. 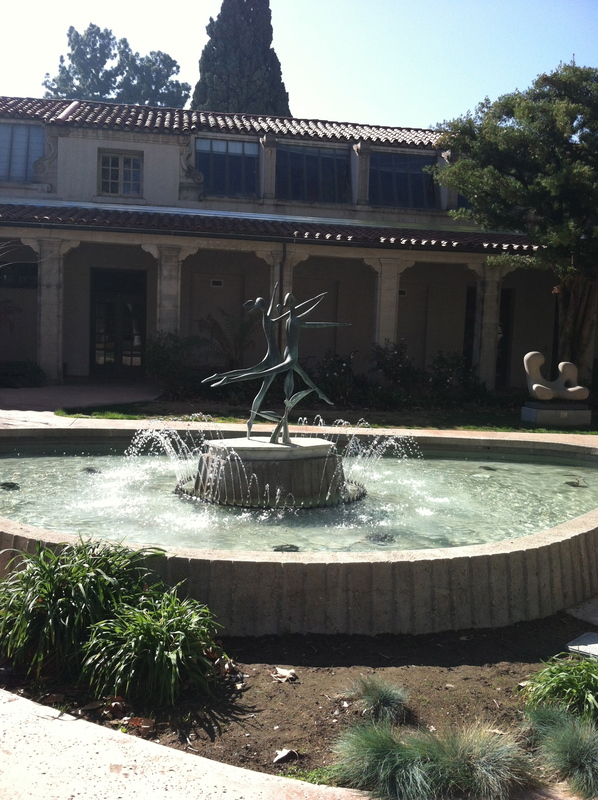 On a student’s birthday, it is the tradition that her friends will take her out and throw her into one of Pomona’s many fountains. The guides seemed to be quite enthusiastic about the practice, which is shared by some of the other Claremont Colleges. For a fun student blog post about the joys of fountaining, follow this link. Hopefully this whets your appetite for further exploration of Pomona College’s website. If you have attended Pomona or recently visited it, I would love to get your impressions in the comments. PHOTO CREDITS: A special thank you to EKD for the use of their photos of the Pomona Campus and to Pomona College for the use of the photo of the beautiful clock tower on their North Campus.